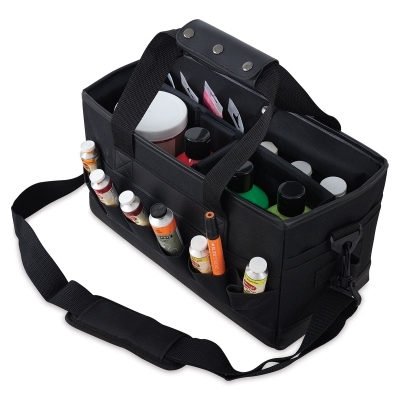 Ideal for art supplies large and small, the Utrecht Art Tote has a variety of external and internal pockets and compartments for transporting everything from sketch pads and painting panels to brushes, palettes, and paints. 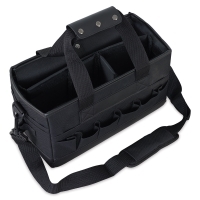 Made from a heavyweight woven fabric, this roomy black tote measures 14-1/2"L × 6-1/2"W × 7-3/4"D, and has a reinforced plastic bottom so you can set it down anywhere without concern. 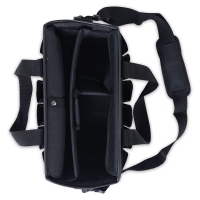 The exterior features 20 small pockets for easy access to often-used supplies. 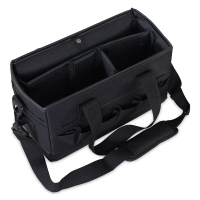 Inside, a unique divider system with hook-and-loop edging allows for up to four additional compartments to be created. 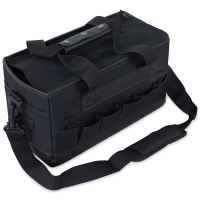 The tote's top flap rolls up and out of the way, secured by a strap and a snap. The webbed double handle makes it easy to just grab and go. 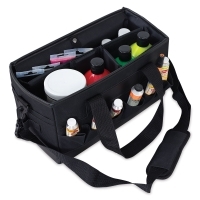 The Utrecht Art Tote is a versatile, essential companion in the studio or in the field.